Blocks are clichÃ©. Creepers are so 2010. 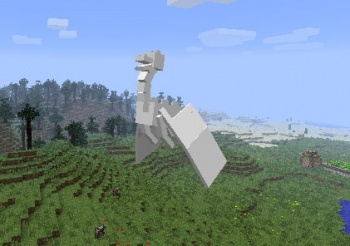 The new Minecraft hotness is stupid-huge flying lizards. This morning, Minecraft creator Markus "Notch" Persson -- though at this point he could also be described as an "empowered figurehead" for the beloved sandbox title -- took to Twitter to reveal his latest addition to the game: dragons! Alright, in truth we only know of a single dragon so far. There may be more, or this single dragon may appear in multiple places as a sort of draconic template. Persson remains coy on the subject, though he was kind enough to offer up a gallery of screenshots centering on the beast. If the dragon looks a bit pale, that's only because the model is still a work in progress. According to Persson, it lacks proper texturing work, though impressively the beast is capable of flying around the blocky landscape of its own volition. So far there's no solid release date on the dragon, or any word on what purpose it might serve in the game. The smart money is on "dragon eats things, possibly burns stuff," though its just as likely that the creature is benevolent, and greets players with the gruff, yet comforting voice of Sean Connery. Admittedly that's just my personal hope, but I think we can all agree that the modern gaming landscape would greatly benefit from an infusion of Sir Sean's warm Scotch vocals.